Joseph DeVeuster, originally from Belgium, was a priest in the congregation of the Sacred Hearts of Jesus and Mary. Sent to Hawaii, he volunteered to go to the island of Molokai to minister to people with leprosy or Hansen's disease. He found the leper colony in a state of chaos with the sad people living like animals. People with the disease were sent there with little supplies and no health care. They were dumped there to die alone so their disease would not spread to other parts of the country. Being thrown away by society, the lepers felt hopeless and unloved until Father Damien came to show them God's love and give them back their dignity. He fixed up the church, built houses, and bandaged wounds. He brought them back to the sacraments, helped them make peace with the world, and then helped make their coffins and dig their graves. 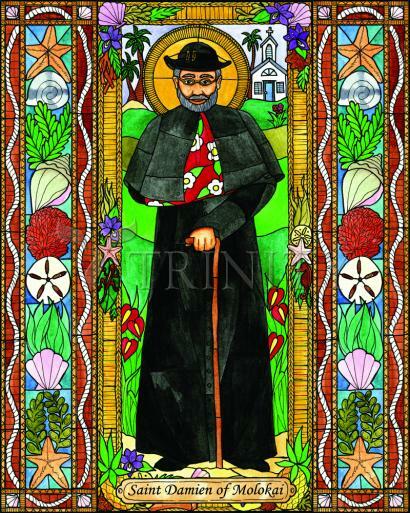 When his time in Molokai was up, Father Damien asked to stay permanently even though he knew that if he stayed, he could catch the disease and die from it. He did catch it and died, but not before changing the lives of hundreds of lepers. Even on his death bed, he never regretted it, feeling his purpose was to light the way to salvation for these people the world had turned its back on. When Hawaii became a state in 1959, it selected Damien as one of its two representatives in the Statuary Hall at the U.S. Capitol. Damien was canonized by Pope Benedict XVI on October 11, 2009.